The age of digital, social media, and mobile has disrupted the music world giving the entertainment industry massive opportunities to stretch comfortably into cyberspace while ushering in a new era for fans, followers, artists, retailers, and businesses. Do you know what it would take to chart a course through this terrain while connecting your target audience with your artist, music, or message? The entertainment terrain is changing and evolving. It’s becoming increasingly clear that nowadays it’s all about rolling out media, entertainment, music, video, and anything engaging for the world to see, hear, visualize, and connect. Friedrich Nietzsche once said, “Life without music would be a mistake.” As brand marketers, this should be your back story. It’s about creating and conveying stories that speak to your customers—valuable, relevant, and compelling content that helps them in some ways whether they serve as an escape, an outlet, or a fulfillment. The stories should be tied to your products and services, but they don’t sell your products and services. How can you best tell your story? There are many ways to tell your story. Perhaps the most important and valuable way is through music. Music is an important part in our society. Each type of music – whether it’s rap, rock, heavy metal, pop, R&B, dance, classical, jazz, orchestral, or opera – elicits an emotion. Life demands continual emotional releases – something most of us found only in music. It plays the listeners’ state of mind so effortlessly that they become the emotional instrument upon which the notes play. Music takes us to places of endless sensual and insensate joy, accessing points of emotions that we sometimes don’t realize we have until that moment of time in which they appear to our amazement. Or, music can plunge us into frenzied weeping state of pain. Music definitely tells a story. What story it tells depends on what message you want to convey to your audience. Every music video, every movie, every song, every commercial, every advertisement, and every other meaningful conversation tells a story. Whether they tell the right story depends on your understanding of your audience and your execution of that understanding. Let’s take classical music as an example and think of it in terms of a user persona – a detailed representation of who your customers are and what they are influenced by. 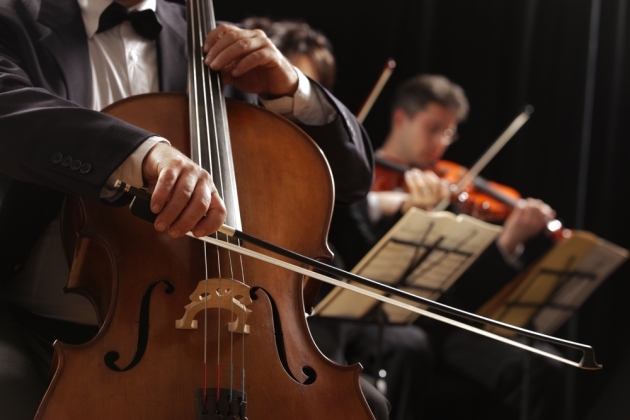 You may wonder how classical music can fit into your brand’s story or marketing strategy? All music, regardless of genre, can positively enhance or negatively impact your message. Let me take you through a journey of visualization as I walk you through my experience of attending a Symphony Orchestra at the California Center for the Arts. The orchestra consists of violins, violas, cellos, basses, flutes, clarinets, bassoons, and bass drum. It includes Beethoven’s Overture to Prometheus, Opus 43, Violin Concerto in D Major, Opus 61, and Symphony No. 3 in E-flat Major, Opus 55 “Eroica”. I’ll use a classical symphony to illustrate the major points that your story with your music should capture. There are many lessons that we can learn from a piece of music. Incorporate these into your marketing and branding, especially in your videos or campaigns. 1. Visualization. Visualizations can tell a story. The visual helps feed the audible, enriching the experience of hearing and seeing a more intense and greater range of pitch and dynamics. Listen to how beautifully the music is playing. A story is being told. Feel the music and the character in the story come to life. Listen to the powerful and stormy compositions. Hear the low tones as it takes you through the trials and complications of life and gets you caught up in its loneliness. When listening to any piece by Beethoven, you receive the whole range of emotions. Just a simple da-da-da-dum can give you the shivers. You can always tell an artist’s state of mind because music can reflect their attitudes and personality. As a listener, I want to judge your video or any media based on whether it captured the essence of the people and life. It is only when an image is conjured that is so vividly painted that it becomes real in all its complexities and contradictions. The intent of your media should elicit the senses. You’re only successful when you paint an image so vividly and distinctly that the listener is able to observe, taste, smell, touch, hear and feel. 2. Content. Consider beat, tempo, timbre, harmonic content, and lyrics. Listen to the emotions, the scarlet eruptions, heavenly processions, and all the powerful human drama that are coming alive. Start with a touch of dolce – softly and sweetly, and leggiero – lightly, gracefully, delicately, and briskly. Envision the ever so lovely dynamics of phrases dropping off into a dreamy pianissimo. Listen as the rustic sound easily elicits an image of people dancing energetically. Feel the beat, the tempo, and the movement as everything is twisted, turned and thrown out with gusto. The solos are passing the melodies to each other and the dynamics deliberately chasing each other. And then, bam, the music brings you unexpectedly as it build up almost slyly to the climax and is followed by a more becomingly revitalized and majestic movement. The melody ebbs and flows. The peaceful intervals of swaying melodies draw you in, emphasizing your expectancy and tension. With all the triumphant and joyful releases that you’re experiencing with the music, the final resounding chords pounded and hammered out with forceful energy. Melodies from brass, echoed by strings weaved in and out throughout each of the movements. The carefully calculated and unexpected, executed pause leaves a hanging feeling of anticipation where you are trying to guess the next unpredictable movement. Your content should evoke your intended emotions. The above example evokes a feeling of suspense and unexpectedness as the listener hears the loud and powerful chords where some memorable movements were like a Stephen King novel while others were more dolce or more playful. 3. Mood. Music sets the mood. Compose catchy melody that conveys your intended mood. Integrate this into your story. Music or a movement, in this case, can definitely paint a power image. Take for example, one movement (Beethoven’s Ninth Symphony). As you listen to Beethoven’s Ninth Symphony, see an image conjured of you walking outside on a gloomy, overcast day in autumn, where the streets are blended with the atmosphere and you’re intermingling with the wind, feeling its singe. And, the music is echoing in the recesses of your mind, conjuring images of some distant, looming storm, like an imminent predator waiting overhead to pounce and working its way to wreaking mayhem and calamity on your surroundings. As you move, the sky overhead swim with an increasingly deeper shade of gray and into hopeless black, and the music in your mind is reaching some vocal climax, foretelling the strong gust of the windstorm attacking your surroundings. And then, unexpectedly, a quiet, soothing violin enters, interrupting your mental vision as the gradual peaceful sound mellows your mood. The winds then calms down, where an image of a passing storm comes into play. Then, in the next movement, you’re in a calm and peaceful place. You’re thinking of the sun bursting forth again, and you’re moving blissfully onward to the meadow of gold where vigorous flowers have survived and thrived amidst the storms and challenges of life. 4. Characters. Characters are revealed in a story. Bits and pieces of a story start to take form and the true self starts to emerge as the story emerges. Music enhances this as people reveal themselves in the story; the audience becomes aware of the continuing core of their own life through other’s stories. Music conveys a universal story yet personable to each individual as they become self-aware of the multifaceted, “I” as the story is revealed. You’re successful when your story and music reveals to your audience the many paradoxical and contradictory versions of their self that they create for different occasions, different places, and different audiences. All good stories are about having an intimate connection with the characters. 5. Cultural Connotation. Consider how social tags, genre, and text aura fit into your story. Who’s your audience? How are their culture fit into your story? What types of music do they listen to? How do their background and experience influence their belief and interests? 6. Location. Your story should capture the topography of place and of the spirit that explores the congruence of the where and who at that moment in time. Your story should celebrate the spiritual and physical selves within the context of a particular place within a particular time period. Enhance your story with music that takes your audience to a familiar place. 7. Time. What time period do you want to convey? What generations are you targeting? Romanticism and classical music have their own style, displaying ingenuity. Bach’s, Beethoven’s and Mozart’s masterpieces are everlasting and will undoubtedly play for generations. Their original touches, alterations, and styles are unique and uplifting and will continue to be felt throughout time, with their pieces being too dramatic and profound to ever be lost. You’d want your story to be timeless and to last from one generation to the next. Choosing the right music is just as crucial. You’d want the moment to be memorable that will leave such lasting impressions. It’s not just about the story but also how the story is told that matters. It’s that emotional connection we have to that story that ultimately will tie us to your products and services. Great storytelling, along with music, can connect you to your customers in measurable ways that can lead to brand awareness, lead generation, and meaningful connections. Rachel, thank you for reading and sharing your comments. I agree. The most powerful stories are well-crafted visions that give significance to mundane tasks, transcend visual thinking, guide behavior in every moment, frame how we see the past, and how we see ourselves in the future. We can use music to influence people and behavior. Music reinforces our initial stance as we weave our experiences into the story that already exists in our minds. We make sense of the world through stories, and music conjures that vision. It’s an emotional experience. Good stories, intensified through music, create an experience in visions that evokes an emotional response.